I have never been a big soup person. I like it and even keep a stockpile of chunky soups in case the zombie apocalypse occurs, but it’s not generally something I crave. So when a recipe title (with no ideas attached btw,…just a title, because this is how my brain works.) popped into my head last night while I was trying to sleep, I knew I had to run with it. Why does that happen, anyway!? Lalalalaa, I’m laying here all drowsy…ahhh, beautiful sleep is upon me…wait for it… CRAP… I forgot to check the kids…I need to sew that button on…I forgot to buy eggs…the cat is impeding my breathing by laying on my neck…I need to pee…and oh yeah, here’s a recipe title with no further info. You have fun trying to sleep now! Signed- your brain. I, like 4,356,982 other Americans, had a bunch of turkey left over from Thanksgiving. When one buys a 20 pound turkey for 5 people, this is bound to happen. But do I ever learn? Nooooooo… not me. I continue to cook as if I have five children living with us, or like when my daughter, son in law and three kids lived with us. Mind you, two teens, a 51 year old man, myself and a six year old can eat a fair amount, but still. A 20 pound turkey?! Am I insane?!! Forget I asked that. I’m going to move past all the tangents. I am obviously not capable of writing a coherent post today. Call it turkey tuckered…cranberry coma, potato pooped, stuffing somnolence, pecan pie peaked…sorry. I’ll stop now. This was one of my throw together ideas. All I had was a name that came at 2am. My husband is fond of saying that my best recipes are the ones I just throw together. The problem being that, half the time, I then forget what I used and you never see these delightful recipes because I am over here foaming at the mouth trying to recall ingredients. Thus why I’m typing this out with a bowl of this yummy chowder in front of me. This really is a delightful chowder…or “chowdah” as my sister in law would say, being the proud Bostonian she is. This is thick and hearty and warming and soothing and any other cozy adjectives that come to mind. It is chock full of turkey, bacon and two cheeses. Since you use leftover turkey and already made mashed potatoes, this comes together quickly. 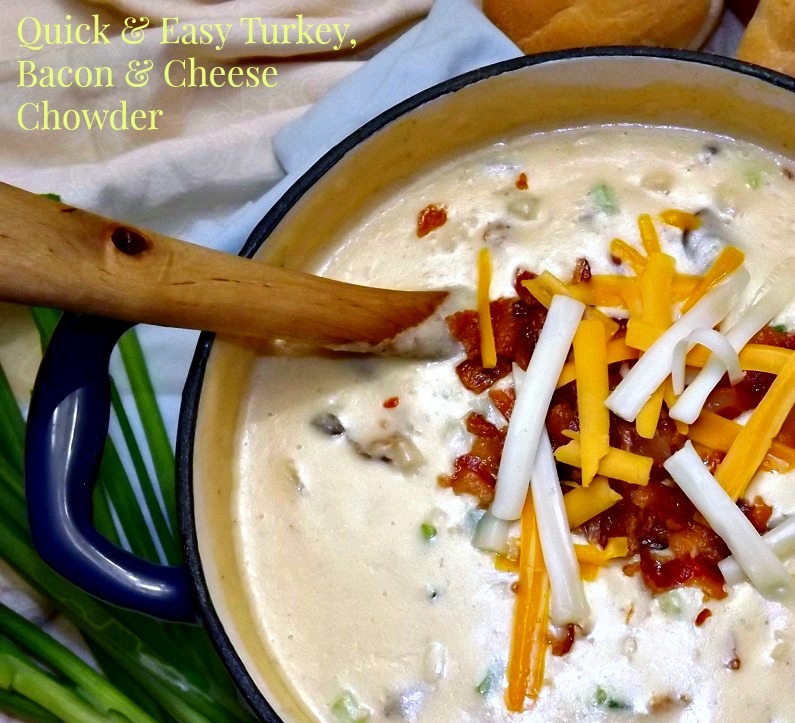 A 30 minute or so simmer and there you go… nice hot, creamy chowder. Erhmmm, chowdah. You know the drill… btw…. I love you guys! Pour the oil into a heavy bottomed pot or dutch oven. I use my purty blue 4 qt dutch oven because…purty. Add in the chopped onions, chopped celery, garlic and mushrooms (if using). Stir to combine, cover then saute over medium heat until softened and the onion is lightly browned, about 7 minutes. Add in the chopped turkey. Stir,and heat just long enough to thoroughly warm up the turkey, about 3 to 4 minutes. Add in 2 1/2 cups of the half and half (or milk) and the mashed potatoes. Stir well and bring to a simmer over medium heat, stirring frequently. Do not let this boil. In a small bowl, combine the last 1/2 cup half and half and the 2 tablespoons flour. Pour the slurry into the chowder and stir to combine. Continue stirring until mixture thickens up somewhat, about 3 minutes. If it’s too thick for your taste, add a wee bit more milk or cream. 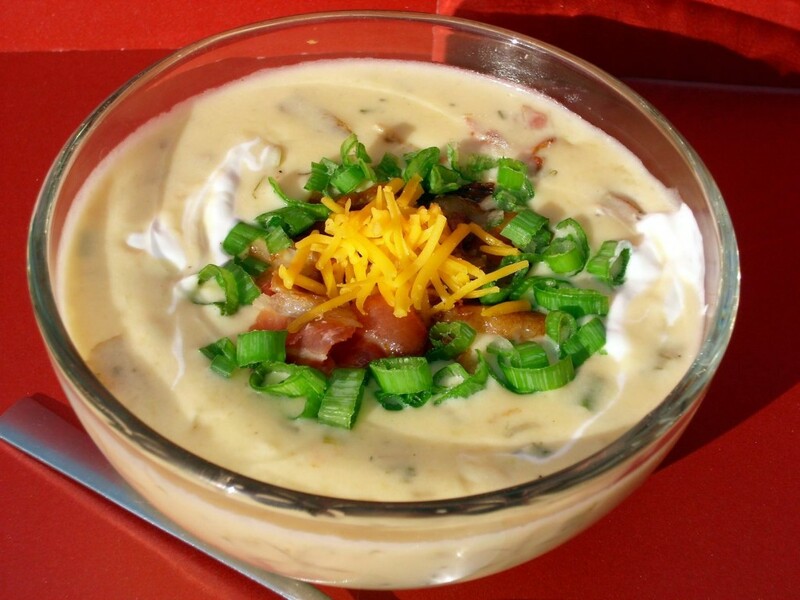 Serve hot, garnished with the remaining bacon, cheese and green onions. Serve with crusty bread and a salad and you have a perfect meal. I wonder how many of my readers are too young to even remember that advertising campaign. Twas back in the ’80’s I believe with the premise being that the “new” oldsmobile (looking back at what now would be an antique car lol. Damn, I’m old) was so modern and improved that it was nothing like what your daddy drove and no longer had the stigma of being dowdy and old fashioned. What the heck does this have to do with food you ask? Whadda ya mean; you didn’t ask?! Why are you here then? So for those of you who ASKED (hmmppphhh to the rest of you). Well, it’s the same with foods. There are some things that get ostracized from the foodie world because they are seen as dowdy and old fashioned. When have you seen a post praising liverwurst/braunschweiger ? or one touting Pickled Herring as the best movie time snack? Once upon a time, both of these things, among many others, were considered delicious every day foods. And while I personally happen to love both, I know I’m in the minority. Foods get pushed aside for the newest trend, a fact I’ve mourned more than once in this blog. One thing though that seems to have held on through the test of time is potato soup. Oh sure, you can look and find some strange ones that use truffle oil and caviar or ones that have the calorie count required by an amoeba as well as the taste of a piece of cardboard. But good old fashioned creamy potato soup seems to be loved by most. There are a few weirdos out there but they also ate school paste as kids and we won’t count them. Their taste buds are still glued together. Combine your chopped potatoes and the 3 cans of chicken broth in a large (preferably non stick) pot. Bring to a boil, then turn heat down to a low simmer. While potatoes cook, in a large saucepan over low heat, saute the onions, leeks, shallot, celery and garlic. You’re not wanting to brown the veggies, just sweat them out and soften them so keep your heat low. When veggies are nice and tender, dump them into the pot with the potatoes. In the same pan you sauteed the veggies in, add the sliced andouille. Turn the heat up to about medium high and cook them until nice and crispy on both sides. Toss them into the pot too making sure to get all the drippings in the pan in there too. Stir well until the mashed potatoes are smooth and let this all simmer together over low heat (keep an eye on this and stir frequently to prevent sticking) for about 30 minutes. Add in your shredded cheese and the cream cheese. 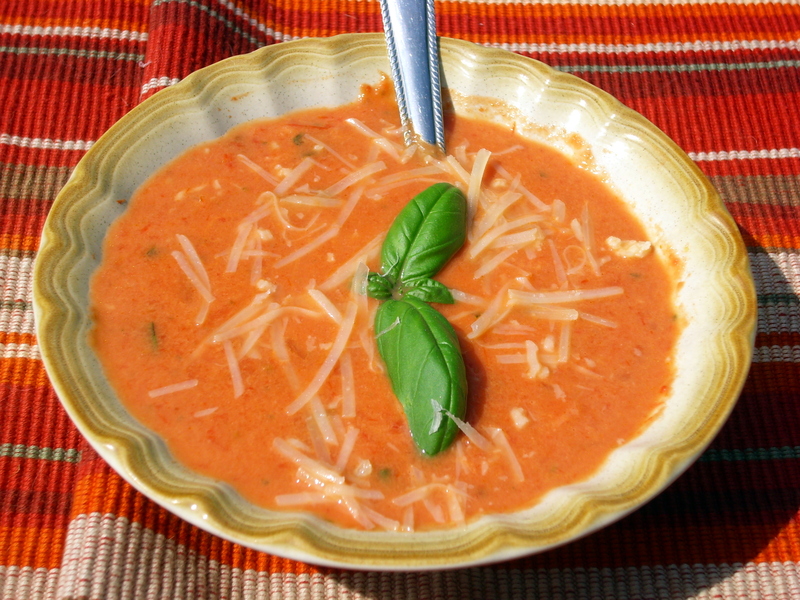 Stir constantly until the cheeses are smoothly incorporated into the soup. Add the half and half. Continue cooking the soup just until it’s heated through. You don’t want to bring it back to a boil because that can break down the cream and sour cream and make the soup very unattractive and curdled looking. 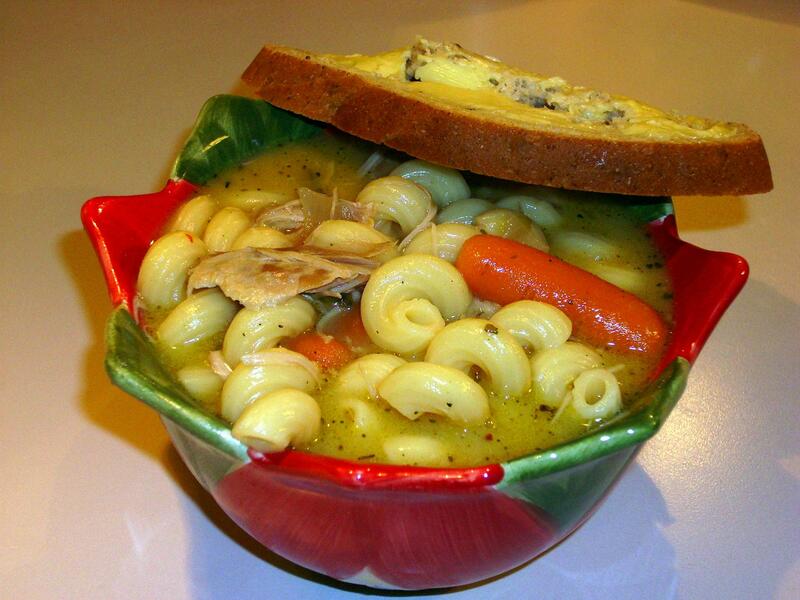 Ladle into soup bowls and garnish with your favorite toppings. We had this served with a buttered dark bread and it was a fantastic, filling EASY meal. I’m weird. No, not cause of that! Or that! Shame on you for mentioning that one… I was young and foolish! What do you mean that was last week!? As I was saying before you so rudely interrupted me, I’m weird. Quit giggling darn it. The reason I’m weird? Because I like Winter. Yep. I do. I like the cold weather though I admit that I don’t venture out into it much because I have the worlds worst circulation and I get cold in August. I like the snow when it happens, I like the coziness, I like being all bundled up in my recliner with a book and a cup of tea while the wind whistles outside my door. The problem this year is that as much as I like Winter, there hasn’t BEEN much of one this year. Where did Winter go!? Who hid it!? I want a REAL Winter! But no matter what, I like all the aspects and feelings that go with Winter. Anyone who reads my blog regularly knows how much I hate that phrase. I have joked before that as much of a foodie as I am (albeit a foodie with a crappy appetite who has to be forced to eat half the time lol) I can’t think of any foods that I would be willing to die for. Not even a medium rare ribeye with potato wedges and roasted brussel sprouts, which is my all time favorite meal (what btw, is YOUR favorite meal??? Tell me in comments section? 🙂 ). I may be willing to be seriously wounded for it (so long as my knife and fork skills aren’t ruined) but no dying. I just can’t think of any food worth dying for. But there are some foods that I love enough (when I bother to eat 😛 ) to consider using the phrase. Twinkies and Cheetos of course. You didn’t know THAT was coming I bet did you? Hehe. Sushi is another; I LOVE sushi though if anyone ever tries to get me to eat the kind with raw eel in it, they are, as my dad would have said, “cruisin’ for a bruisin’. EWWWW!!!!! GOOD chocolate (we’re not talking Hershey bars here though there is a time and a place for them too) is something to think about using silly phrases for. Buy me a pound of Godiva (or twelve) and I’ll think about it. Buy me more and I may ask you to marry me. Just don’t tell my husband. He can be a bit touchy about that for some reason. Silly man. I’d share the Godiva. Maybe. But this following recipe is so utterly delicious, so supremely satisfying and so summery (even with the use of canned tomatoes) that I actually thought about using the phrase “to die for”. I didn’t of course; I have my standards but I THOUGHT about it! That right there should tell you how wonderful this is. 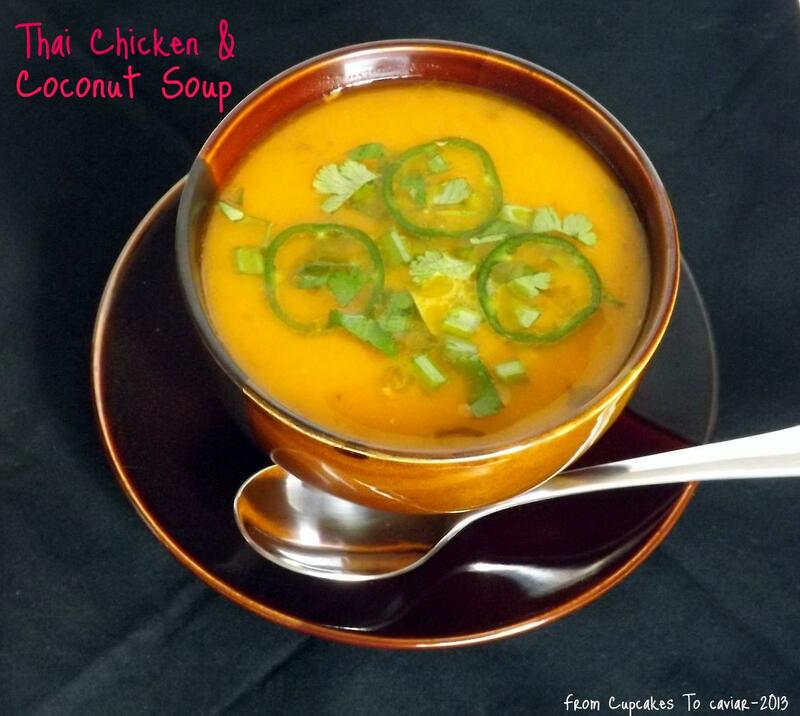 I have only been to the restaurant this soup is purported to have been cloned from two times and I thought the food was passable but nothing worth writing home about. I had not however had this soup. I have made this a couple of times for my family and even my picky kids love it. This is creamy and tomatoey (again; now a word 😛 ), bursting with the flavor of fresh Basil with a mild sweet edge that helps cut the acidity of the tomatoes. Summer or Winter, this is a winner. So give it a try. Even in this hot weather, this is SO good! This is adapted from a recipe on top secret recipes. In a large pot over medium heat, saute the onion and garlic in the olive oil for about 3 to 4 minutes until softened. Add the crushed tomatoes and chicken broth and bring mixture to a boil then reduce heat and simmer for 20 minutes. Turn heat off and let cool for up to an hour. Pour half the mixture in a blender (hold lid down with a towel if the soup is at all hot so the lid doesn’t fly off). Blend on high speed for about a minute and pour into a large bowl. Do the same with the second half (I actually don’t do that because I like a little bit of texture in the soup). Add all the soup back to the pot and add the remaining ingredients. Bring the soup back up to a low bubble then reduce heat and let simmer for 20 minutes. Garnish with desired toppings. I use Parmesan cheese and some julienned basil.